Normally I would say that the best part of coming home from being away for a week was getting to sleep in my own bed. Not this time. The Hampton Inn that I stayed at had a Sealy Posturepedic Reserve Collection mattress … pretty much heaven on earth when it comes to sleeping. I think it is time to retire my 12 year old mattress. Now I just have to put that on my “to do” list. 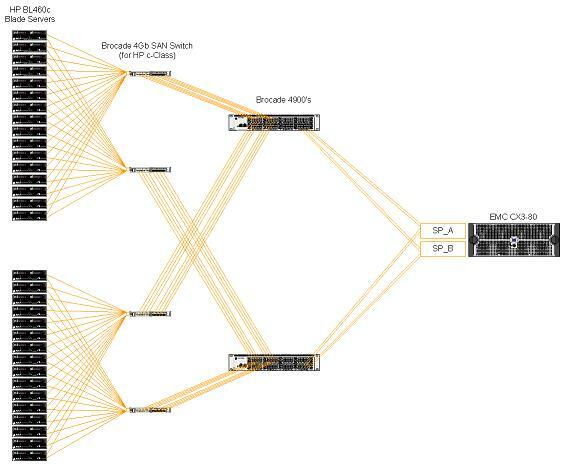 So for my more technical audience, I thought I would go into greater detail about the topology and components that make up the SAN we are deploying at work. For many people, the term SAN is used just when speaking about the FC disk system. A SAN is actually comprised of much more than just the disks; it is made up of the servers, HBAs, FC switches, tape libraries, and the storage processors that attach to the back-end disks to the fabric. Day 2 was all about working in Navisphere. Navisphere is the management software that controls an EMC SAN. We started off the day by installing the agent and PowerPath software on Windows 2003 host machines. Then we worked through lab exercises where we created RAID groups, built LUNS, and assigned hosts and LUNS to Storage Groups. We learned how to use diskpart to initialize and align the LUNS for the Windows host machines. Later in the day we learned how to expand LUNS by using LUN migration and Meta-LUNs. I’ve included a screenshot of the Navisphere interface below. Right now we are working on setting up Microsoft Clustering with storage LUNs in the SAN. That should be fun … I haven’t done Windows clustering in about a year. Later today there is a factory tour to go see where Dell makes their servers. I’m still on the fence about going. They want us to sign an NDA that lasts for 3 years!! I didn’t have to sign an NDA when I took a similar tour with HP last fall. And if I do decide to go, I really wouldn’t be able to tell anyone about it anyway. Hard to see the value. Training is going well so far. The morning got off to a bit of a slow start, but the pace is picking up rapidly. We’ve covered the basics of SAN design and terminology, and we are moving along into territory that is new. The physical hardware is sitting in a room just off the training room. 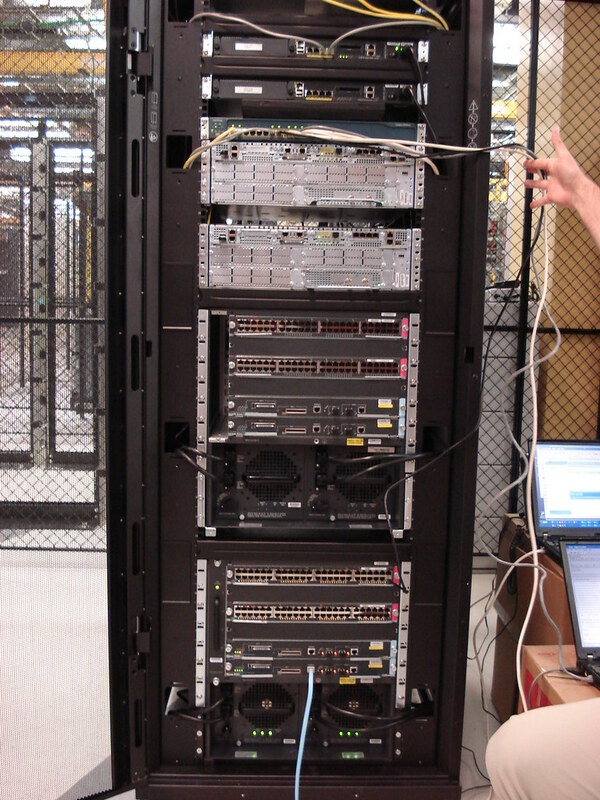 Each two person team was assigned a rack containing two servers, two SAN fabric switches, and some flavor of EMC Clarion SAN. 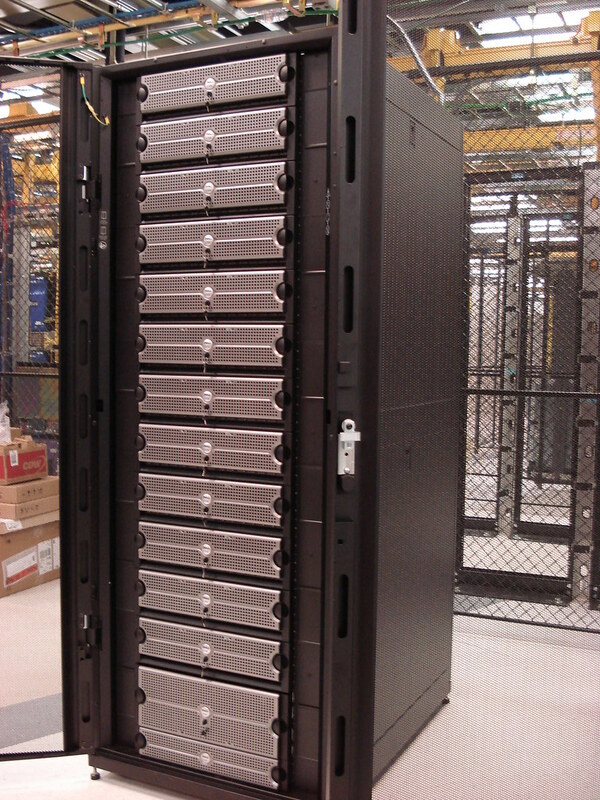 Our rack has a CX3-40 (which is one step down from what our company purchased – the CX3-80). Aside from minor cabling differences, the management tools for all the systems are the same. The afternoon lab was geared toward learning how to zone the Brocade SAN fabric for the two host servers. The first step was installing the QLogic and Emulex device drivers on the two lab servers. Then we had to use the vendor supplied tools to learn the world wide names (WWN) of each host bus adapter (HBA). Once we had that documented, it was time to dive into the switch zoning. And that is when the fun started. The switch I was working on saw the two server HBA’s correctly (one Qlogic, one Emulex), but I only saw one of the two front-end ports on the storage processors. On a hunch, I decided it must be a physical connectivity issue … and it was. The lack of a link light and a dangling FC cable were the clues. We plugged it back in, got a link light, and refreshed the switch managment utility. Bingo. Problem solved. I accused the instructor of trying to trip us up. It was a great lab exercise, and I think I enjoyed it even more because of the challenge. Tomorrow we will tackle management tasks within Navisphere (creating RAID groups, LUNS, etc). So what do I do every day at work? I have two long-term projects right now. One of those is the migration to an offsite datacenter. 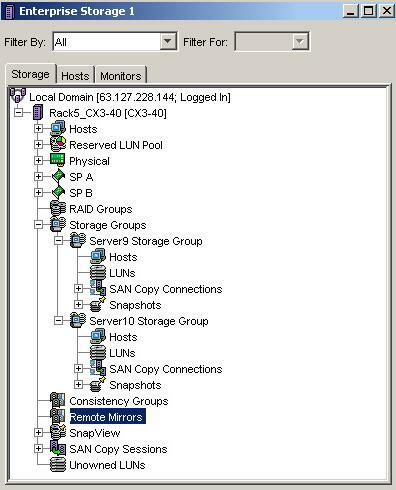 This started back in August of 2006 when I began looking at options for different storage and server vendors. Right now we are in the installation phase. All of the equipment we ordered has been arriving at our offsite facility. We will end up with three racks: MDF, Servers, and Storage. The servers are still in transit, but the MDF and Storage racks are nearing completion. Thought you might like to see pictures (click on the photos for full size images). I will post more photos once the servers arrive and get installed. I love birthdays. I had over a dozen emails and e-cards from friends, family, and coworkers that landed in my inbox throughout the course of the day. I also got a balloon on my desk (so everyone who walked by my office knew it was my B-Day). I was treated to lunch (and drinks after work) by my friends. Thank you everyone – you know who you are. I’m going to have to start doing more for other people on their birthdays. Now that my Amazon list has been totally raided – I guess I will have to start thinking of new items to fill it back up. A special thanks to my family (who went overboard I might add) for all the packages that have trickled in over the last few days. I enjoyed getting home to see what was waiting for me next. I have enough DVD’s, books, and other goodies to keep me busy for a while now.